Four hikers went on the Temple Fork - Spawn Creek hike: Jane, Dave W. (the leader), Dave P. and Denis. Our plan was to visit four springs as we hiked in a big loop around Temple Peak and back to our starting point. 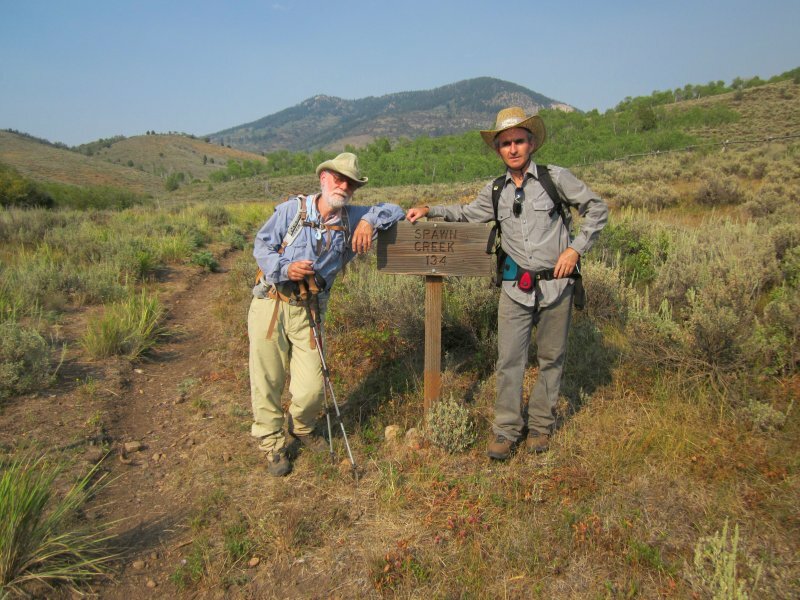 The group left Smith's parking lot in Logan shortly after 8:00 A.M., drove to the Spawn Creek Trailhead in the Right Hand Fork of Logan Canyon, and started hiking south on the Temple Fork Trail about 8:55. The trail to the Temple Fork Sawmill site was in very good condition, although the the rain last night caused mud to cake on our boot soles as we walked. Recent beaver activity starting at mile 1.75 resulted in a number of logs across our path and several new ponds along the trail. We got to the sawmill site about 10:15 walked to the spring located about 0.2 miles toward the south. We know this excellent spring as "Sawmill Spring", but it is not named on our topographic maps. Jane left the group and returned to the trailhead and the remaining hikers resumed our travel up Temple Fork, where we encountered a hiker with several elk antlers. There is no maintained trail here, but an old wagon road and an intermittent path led the way to Temple Spring at mile 4.5. 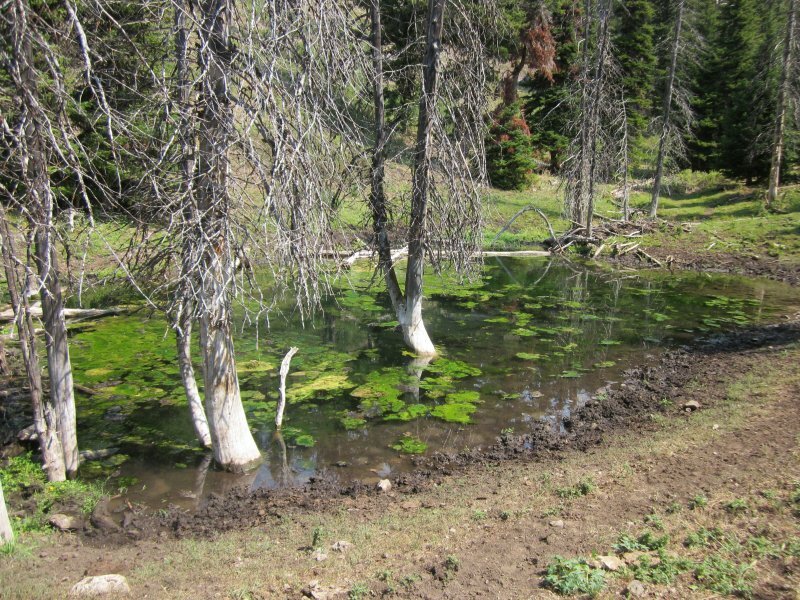 This spring feeds directly into an old beaver pond, and it was the last time we saw flowing water until Spawn Creek. An automatic camera fixed to a nearby tree let us know that hunters were keeping track of game activity here. We came to the Shoshone ATV (all terrain vehicle) trail one half mile after the spring and followed it to the Sinks road and Log Cabin Hollow at mile 5.9. We were happy to hurry past several camp trailers here, along with barking dogs and noisy ATVs that spun "doughnuts" and raced up and down the road. We left the Sinks road at mile 7.2 and walked another half mile past more camps and barking dogs to Elk Spring, which was little more than a stagnant watering trough. From Elk Spring, we went north along an abandoned jeep road, where we stopped for a belated lunch. We would have stopped sooner, but this was the first peaceful spot since we got to the ATV trail. We reached the high point of the trip about mile 8.5, just past our lunch spot. Our route continued north along the old jeep road another half mile to the upper Spawn Creek (and more trailer camps). The trail down Spawn Creek was an old road at some time in the past. 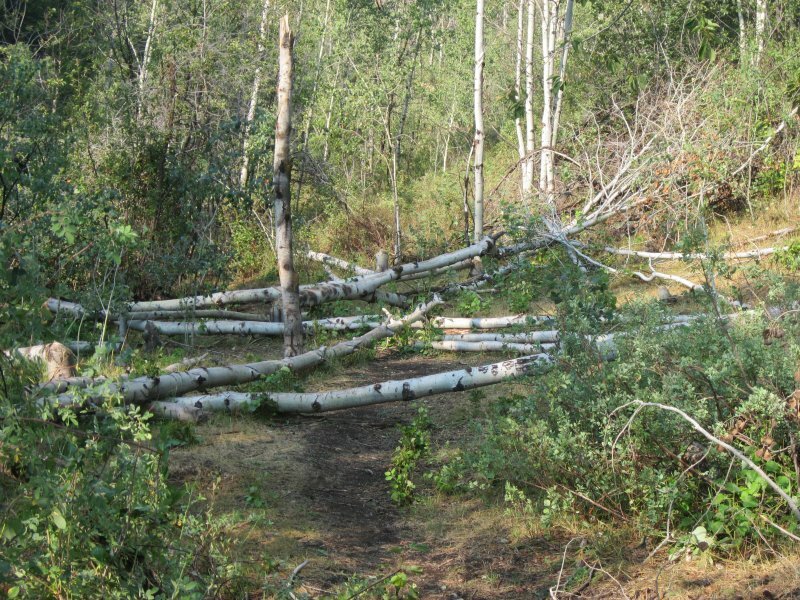 It was good walking for the most part, but trees blocked the way at least five times, and there is a confusing section where beaver and livestock activity have scrambled the trail. 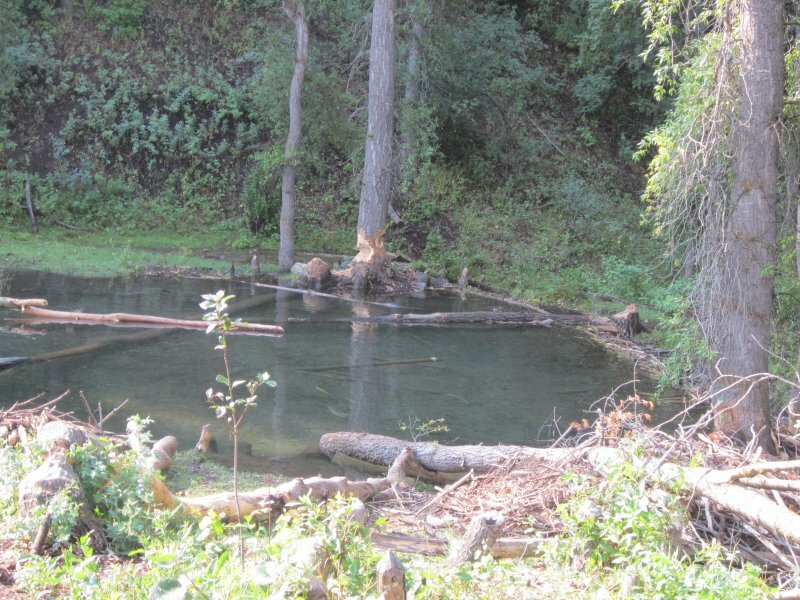 We stopped at Temple Aspen Spring at mile 10.5, where water from several small springs joins to form a stream. 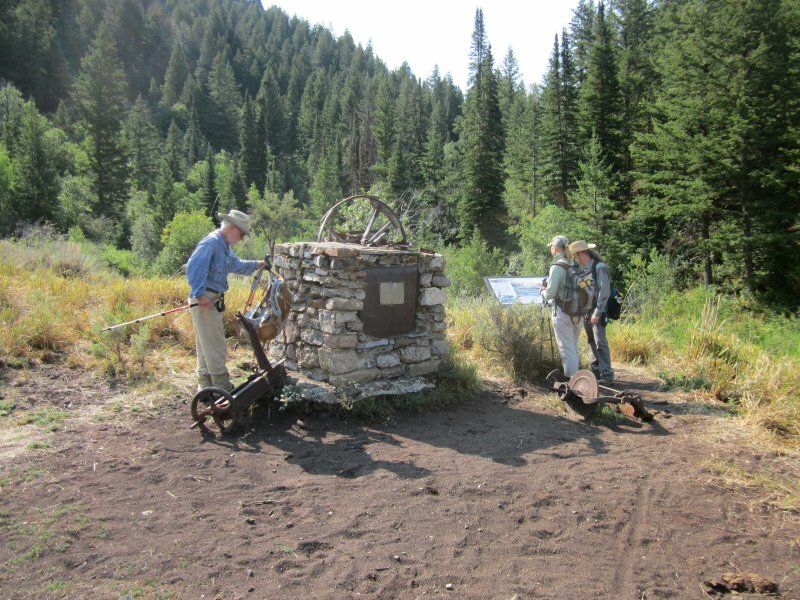 At mile 12 we examined the remains of an old water wheel, most likely the site of another sawmill. Finally, we arrived at the Spawn Creek Trailhead about 5:15 P.M., and an hour later we were back at our Logan meeting place. This was a good trip, over all. The weather was a bit on the warm side, but the sky was clear and there we enjoyed a light breeze. We saw an eagle, several hawks, fish in the stream and lots of beaver activity. Unfortunately livestock have impacted much of the way, leaving denuded vegetation and churned-up soil in shady areas. Livestock activity also has obscured the trail in places, and of course, we had to keep an eye out to avoid stepping in manure. This could be a more pleasant hike earlier in the summer, before the cattle have disturbed the area so much. Our hike totaled 13.5 miles, with about 2700 feet of elevation gain and 8.5 hours on the trail. Less than a half mile from the end of our hike! 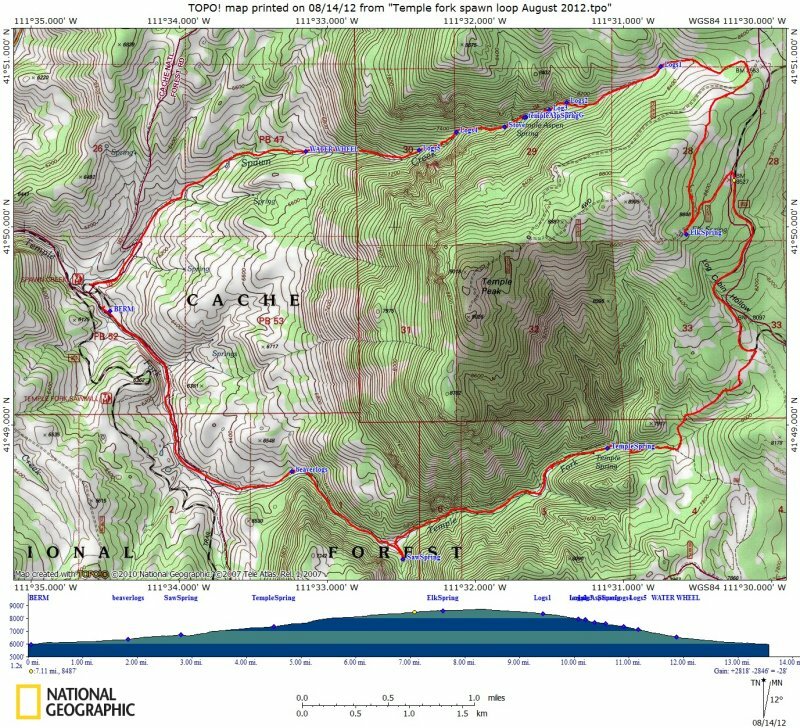 This map shows our GPS track and elevation profile (13.5 miles, with about 2700 climbing).